Sometimes I use something almost every day and I think nothing of it. 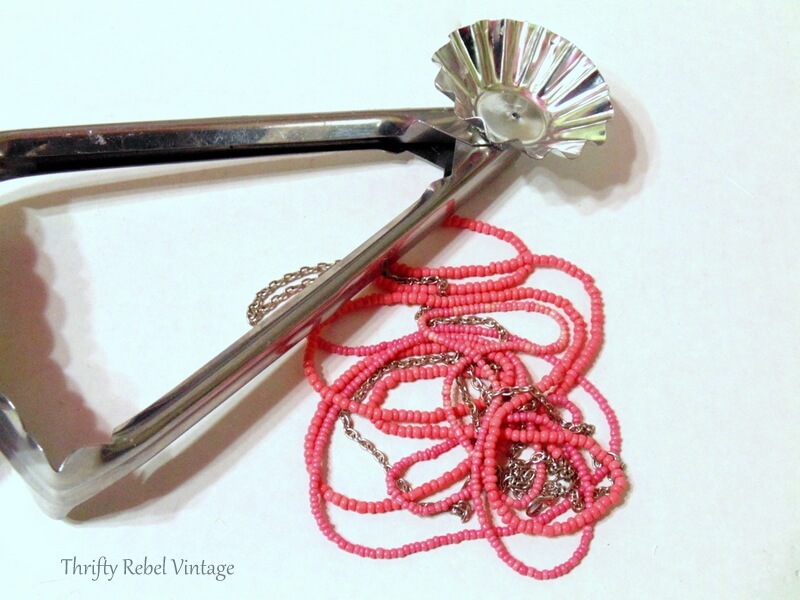 Then I’ll see that same thing in a thrift store 25 cent kitchen gadget bin at Christmas time and an idea pops into my head and I think, noooo… that’s crazy. But I buy the thing anyway. Then I buy another one, and another one, because that crazy idea is still percolating in the back of my brain. And after a while I convince myself that it’s not so crazy after all. Am I crazy? For sure. lol. 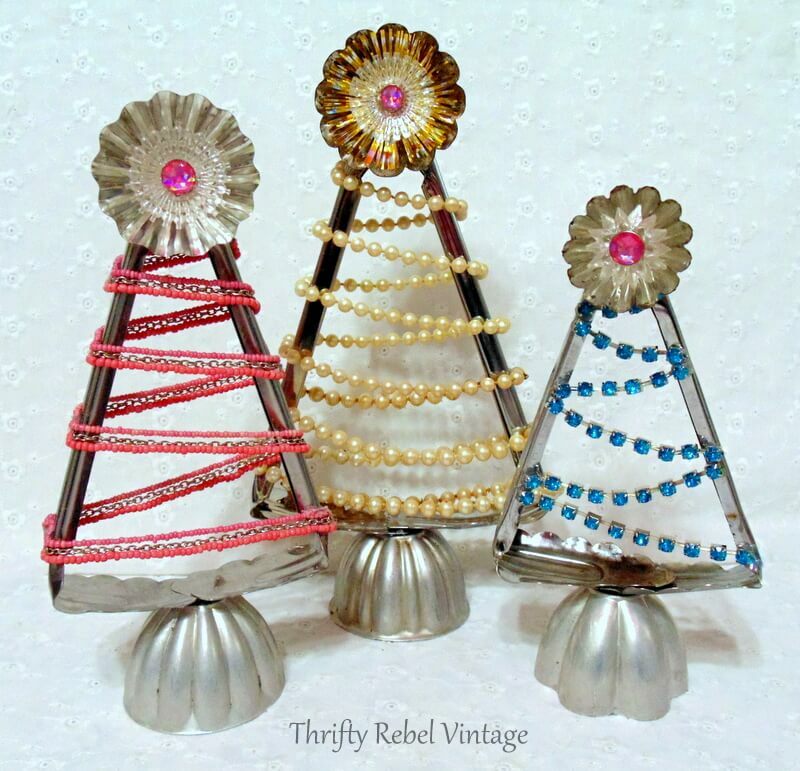 So here are my repurposed salad tongs made into DIY Christmas trees. I do love to repurpose things into trees every Christmas season, like this cute little Tart Tin Tree, and this funky Repurposed Hand Saw Tree. 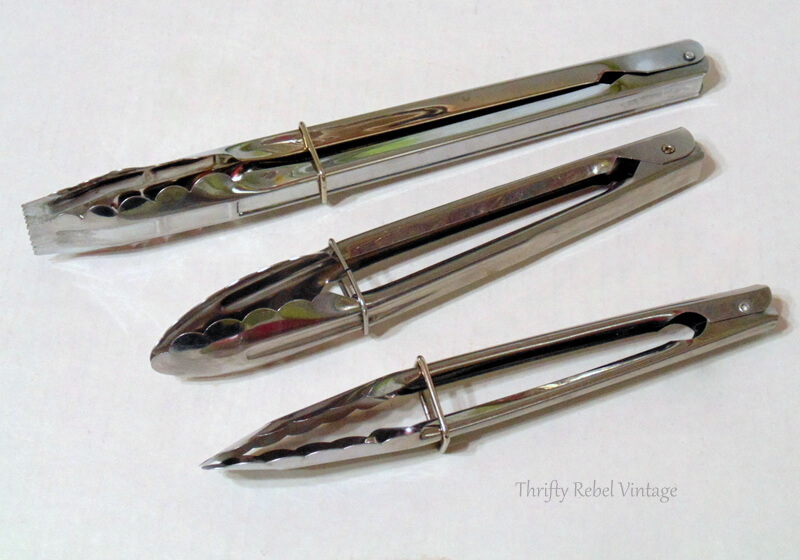 Here are the salad tongs that I’m using for these trees… in three different sizes. 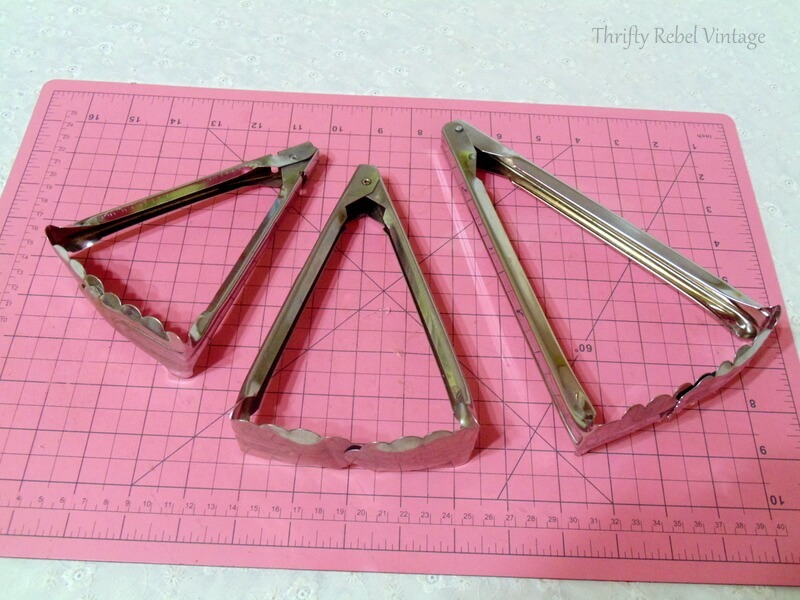 These are the cheapie lightweight metal ones. In the next step you’ll see why heavier ones won’t work for this project. 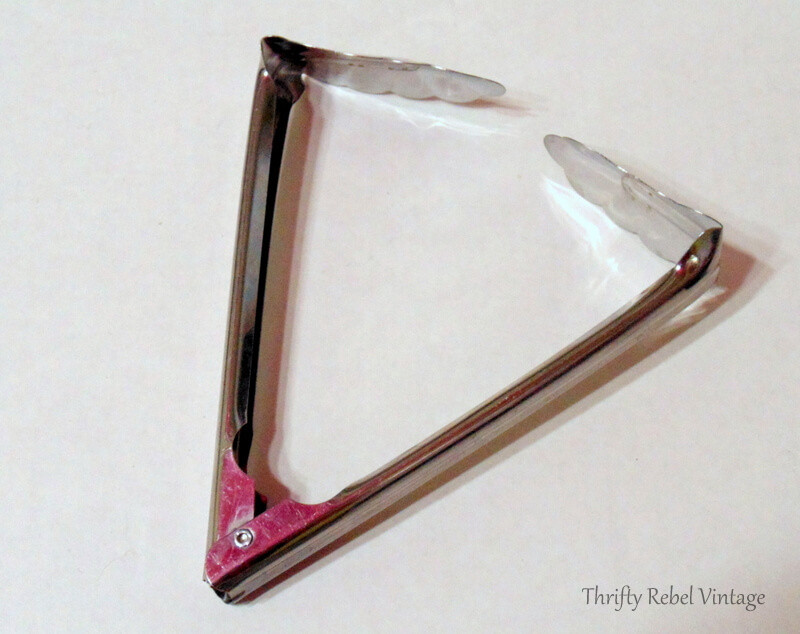 The cheapie salad tongs are super easy to bend, first the one end. 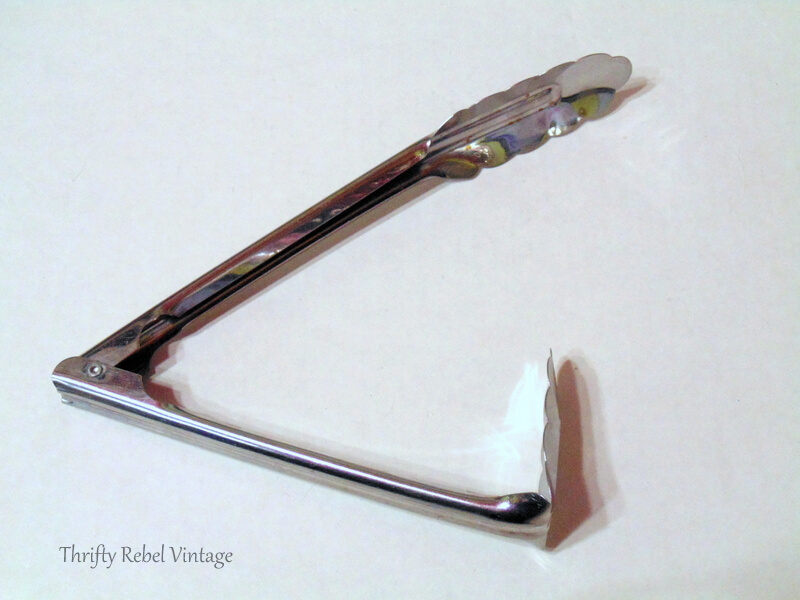 Before bending you can remove the holder thingy that keeps the tongs closed. It won’t be needed and it’ll just get in the way. It’s starting to look like something now. Then you just glue the bent sections together one on top of the other in a tree shape that you like. You can go super skinny or wider, whatever appeals to you. 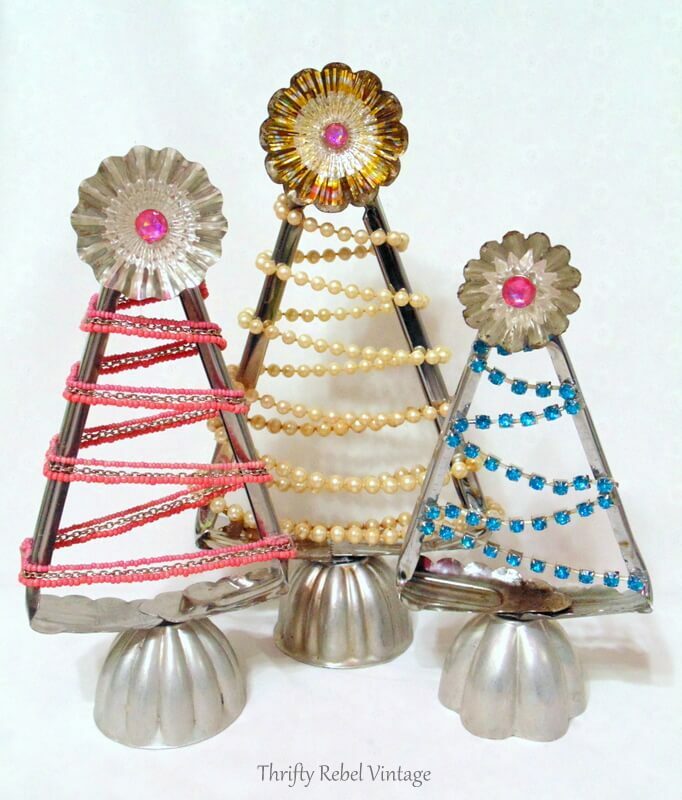 Before I started decorating my salad tong trees I glued my tart tin at the top so I could gauge where I wanted to start my garland. 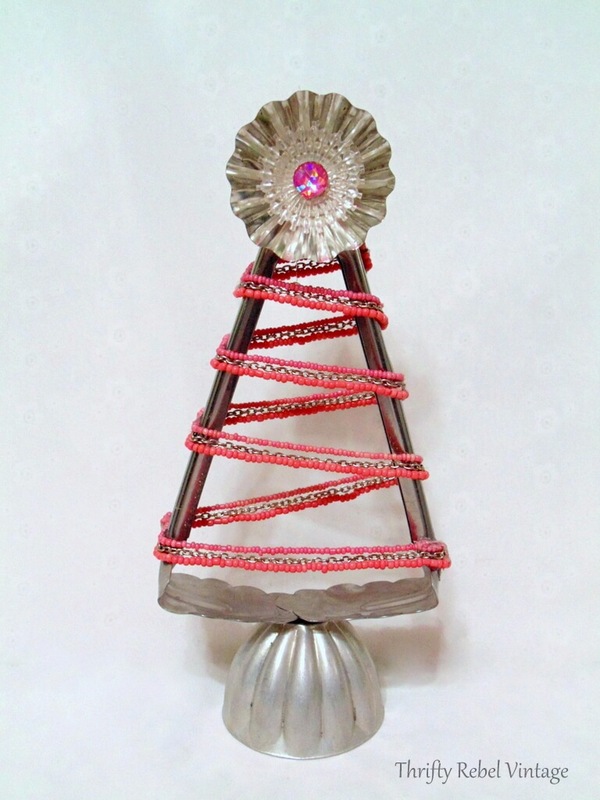 For this tree I’m using a three-section pink bead and metal chain necklace. I started at the top at an angle that looked good to me. This really is just a wing it kind of thing. Whatever looks good to you will work fine. Add glue to the sides as you make your way down the tree. This way you don’t see any glue on the front. The nice thing about this is that you also see the necklace on the back and you get a double effect. Keep making your way down until you’re done. TIP: it’s a good idea to do a dry fit first to make sure whatever you choose is long enough to make it all the way down. 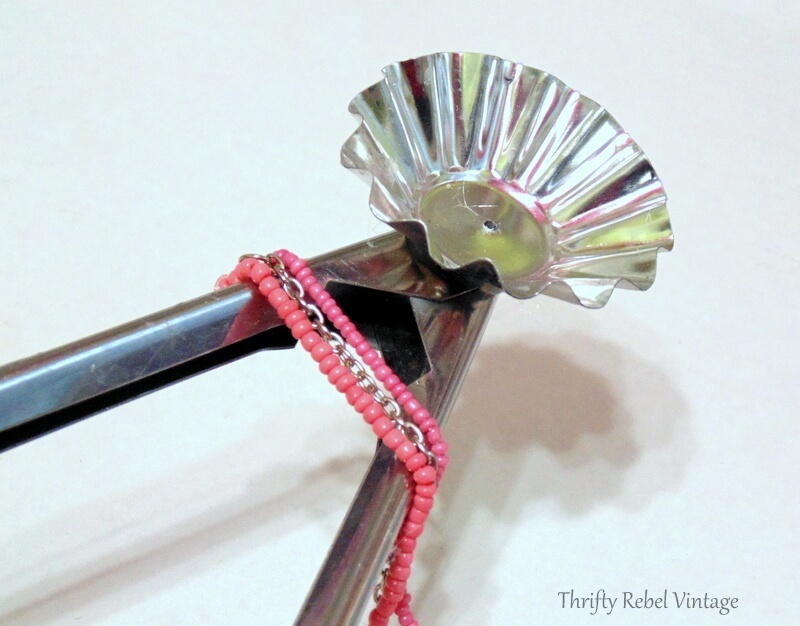 To finish off my salad tong tree I glued a vintage plastic light reflector inside the tart tin topper. Then the whole tree got glued onto a vintage jello mold as the trunk. 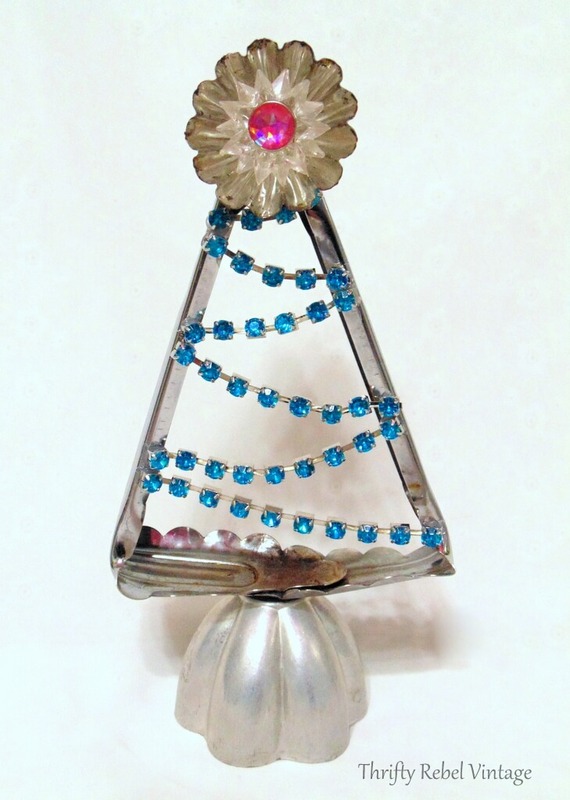 This salad tong tree was decorated with pieces of two faux blue rhinestone bracelets, and a different plastic light reflector was glued inside the tart tin. I didn’t have enough bracelet to go around the back as well so I just glued the garland on the front. 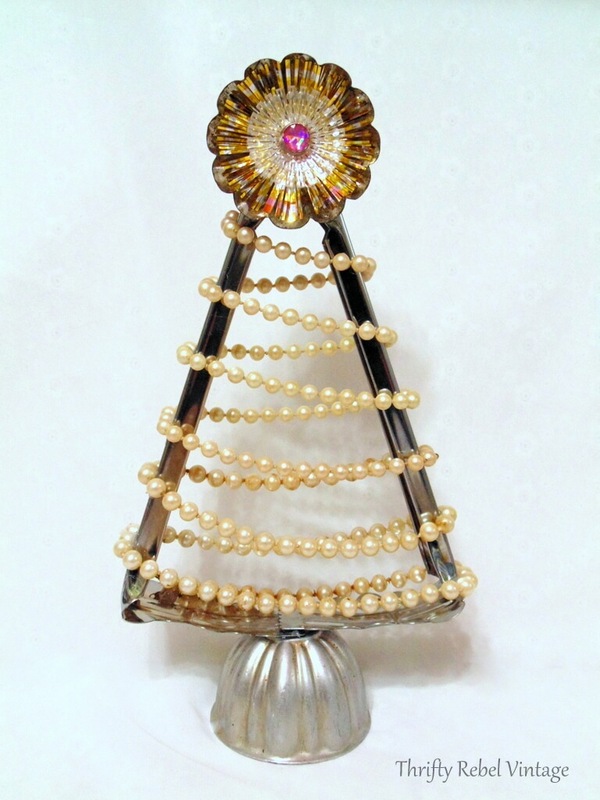 For this diy Christmas tree I used two faux pearl necklaces, and another different light reflector inside the tart tin tree topper. 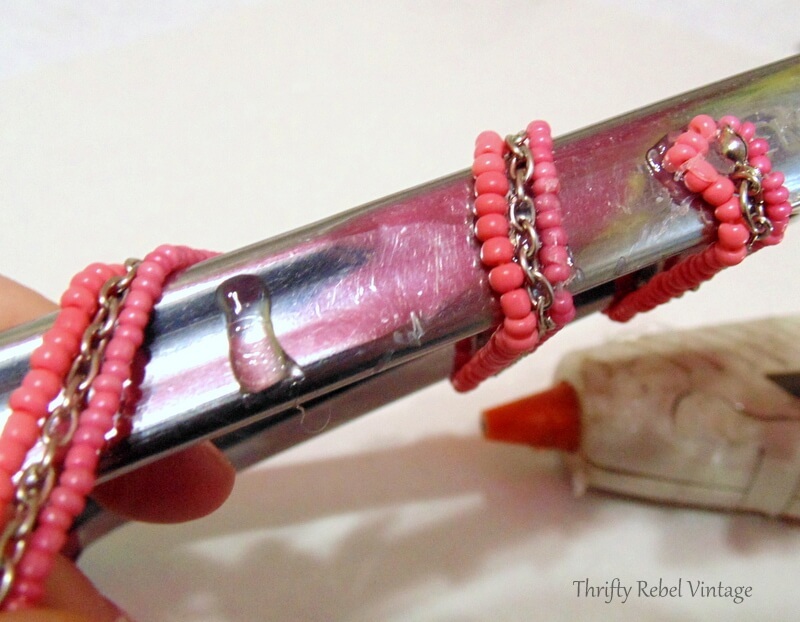 I used the same pink bead from a broken thrifted bracelet that I took apart inside each light reflector. So even though each salad tong tree is very different, the tree toppers sort of pull the three together. So, I have to say that my salad tong trees aren’t looking so crazy to me now that they’ve become a reality. They looked a little crazier when they were sitting inside my brain. lol. 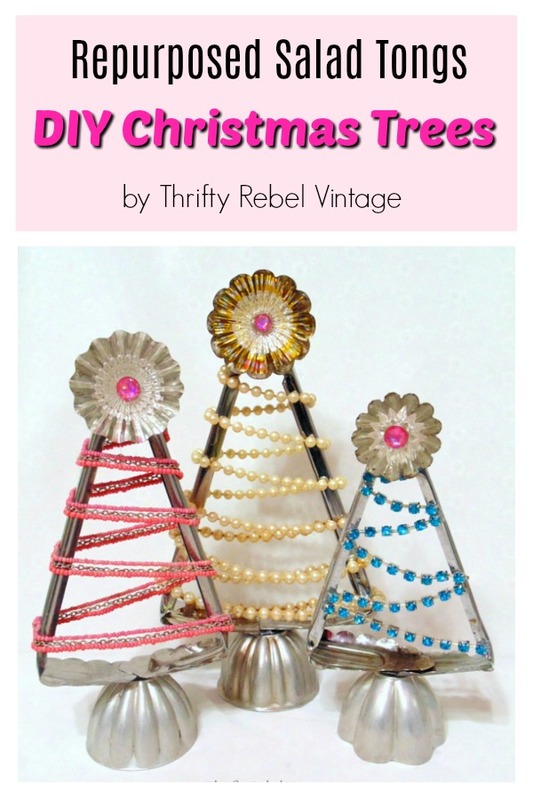 These are so easy to make, and you can use anything around these diy Christmas trees; twine, rope, lace, ribbon, beading. Whatever you have or whatever you can think of. So, what do you think? Crazy or not? 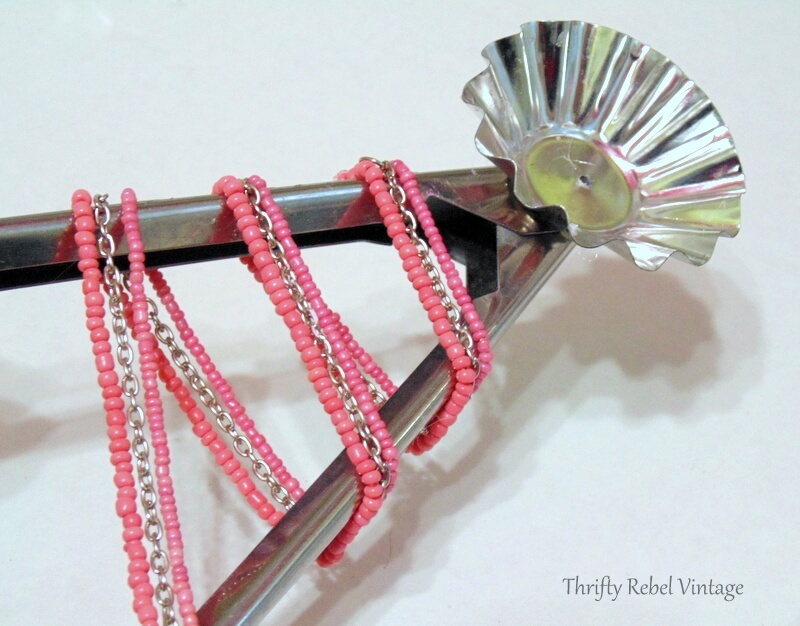 Save this crazy project for later by pinning! 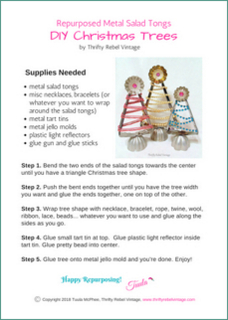 You can find my Salad Tong Trees Project Tutorial FREE printable in my member-only library. If you’re already a subscriber the library password is at the bottom of every email. If you’re not, you can subscribe at the bottom of this post and you’ll receive an email with the secret password. Yup! Definitely crazy but oh so cute! Every time you post another craft I am more amazed by your imagination! I think they turned out fantastic! I love them! I love anything that is unique! Thanks Deb! I love unique things too. My goodness! I love these! I have some red and white and green and white baker’s twine that would be grand as garland. It’s way too thin as is but a nice crocheted strand or even braided would work. ooo what else do I have?! You sparked my brain this morning! Thanks! So original. I’ve never seen anything like this. 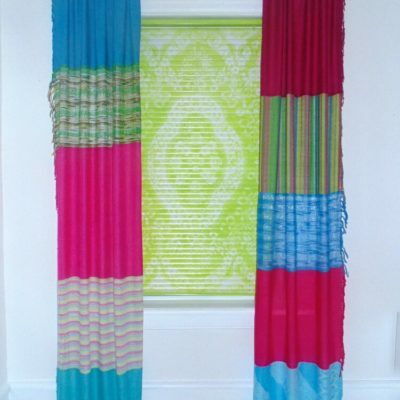 Love them and now I want to make one. Your craft ideas are like reading a good mystery book. You start with just enough information to peak my curiosity. Before I read anymore I try to figure out where you are going with this. By the end of the story I am amazed and love the end result. Thanks again for another wonderful idea. Thanks Ronnie! Definitely an easy project. Tuula, these are sooooo cute! My family loves homemade things like these and I’m gonna start collecting for next Christmas! You are just so clever and give me and your followers great ideas!! Thanks for sharing and Merry Christmas! 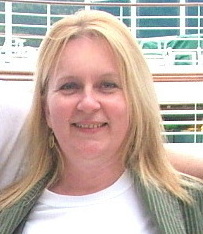 Thanks very much Karolyn! I’m thrilled that you’re going to give these a try. Merry Christmas to you! Oh my goodness, you come up with the most unique ideas! I love these! LOVE, LOVE, LOVE!!!! Thanks for sharing, what amazing inspiration!! Such a clever idea and Oh, so cute. I love your trees. How clever! Thank you so much Judy! I wish you a wonderful joy-filled holiday season! Adorably CUTE! 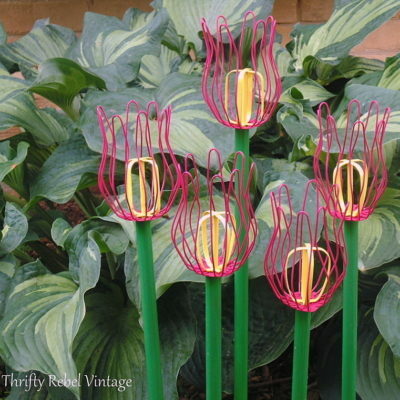 Love the whole set of three, wonderful display on a mantel or table. Sweet! Thanks very much Kippi. Happy New Year to you! This is just too clever Tuula! I need to get inside your brain b/c I never would have thought of this in a million years! Thanks Florence! 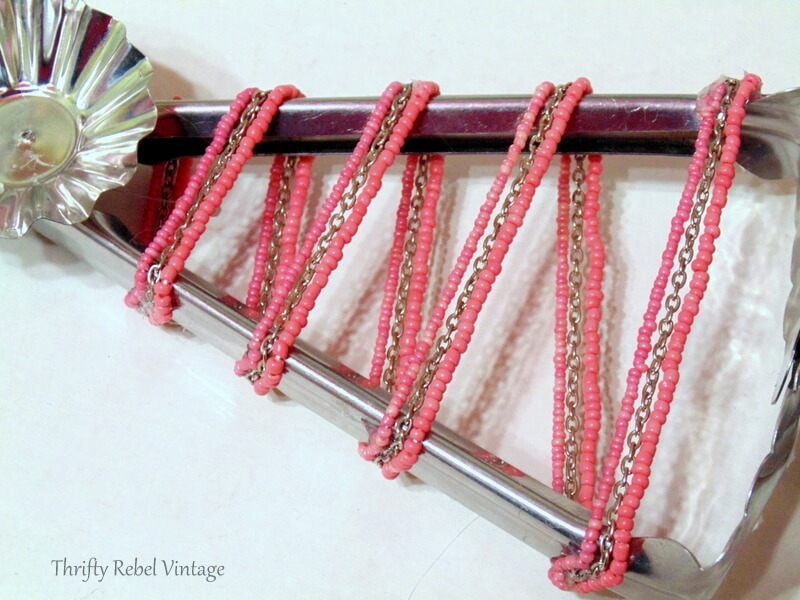 I’m always looking for cool things to repurpose into Christmas trees, and these salad tongs were perfect.